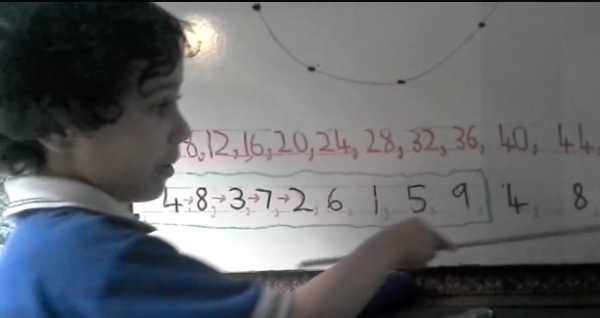 7 year old maths genius Amir shows us what happens to the 4 times table when you apply a vedic mathematical principle called sutra digit sums. This is when you take the digits from a given sum and add them together- so in the example of 3×4=12 you would add the 1 and 2 which would give you 3. If you are given a number which is equal to double digits you add the double digit number you are left with after the initial sum until left with a 1 digit number. In the example of 12×4=48 you would add 4 and 8, giving you 12, then you would add the 1 and 2, giving you 3. When you you apply this formula to the 4 times table we are left with a beautiful geometric pattern which has significant symbolic meaning. An enneagram is a nine pointed star composed of three overlapping triangles. Another type of enneagram was devised by the esoteric philosopher Gurdjieff, a nine pointed glyph. The emblem’s unusual shape is constructed by mapping the sequence of musical octaves, and has come to represent Gurdjieff’s Fourth Way Society and its philosophies. Gurdjieff’s enneagram is likely based on the kabbalistic tree of life, and accordingly, is said to represent the underlying geometry of the universe.
? Groundbreaking Study Confirms Link Between Fracking and Earthquakes Big Oil’s Nightmare Comes True ?